Lifting off from the Taiyuan Satellite Launch Center (TSLC) in China’s Shanxi Province, a Long March 2C rocket orbited the PRSS-1 and PakTES 1A Earth-observing spacecraft for Pakistan on Monday, July 9. The mission got underway at 3:56 GMT (11:56 p.m. EDT on July 8) from TSLC’s Launch Site 9. Mission success was confirmed by the state-run Xinhua press agency about one hour and twenty minutes after liftoff. The mission was initially targeted for June 2018, however, China decided to reschedule the mission’s start to July, not disclosing the exact date. There were some rumors that the mission was expected to lift off on either July 6 or 21, but these dates were not confirmed by Chinese officials. Very little is known about pre-launch preparations for Monday’s flight. Beijing usually keeps details regarding its space operations under wraps, even if they are conducted on behalf of foreign customers. Given that the passengers of Monday’s flight were intended to be delivered into a Sun-synchronous orbit (SSO), it is assumed that the mission concluded with the orbital insertion of the dual payload within some 30 minutes after leaving the pad. PRSS-1 (Pakistan Remote Sensing Satellite) is an optical satellite designed for Earth-observing purposes, mainly monitoring oceans and weather. The satellite’s platform is based on the Controller Area Network (CAN bus) including standard and features solar cells capable of generating up to 600 W of power. The spacecraft will be operated by the Space and Upper Atmosphere Research Commission (SUPARCO) – Pakistan’s space agency. The designed lifetime of the satellite is some five years. In order to perform the observations of our planet from an SSO at an altitude of 430 miles (700 kilometers), inclined 38.28 degrees, PRSS-1 will utilize a high-resolution electro-optical payload that it is equipped in. “The imaging Payload System is equipped with High resolution CCD sensor which is used in IKONOS, QUICKBIRD satellite for imaging with high speed Data Acquisition and Transmission to Ground Segment. The protocol implementation for communication of PRSS to Satellite Ground Segment is fully CCSDS complaint which can easily be interfaced with any standard Ground based equipment,” SUPARCO informs on its website. PRSS-1 is a replacement for Badr-B – SUPARCO’s first Earth observation satellite. Badr-B was launched into space on December 10, 2001, from the Baikonur Cosmodrome in Kazakhstan by a Zenit-2 rocket. PakTES 1A is a remote sensing satellite indigenously developed by SUPARCO. It weighs about 628 lbs. (285 kilograms) and is fitted with power-generating solar cells. The spacecraft is planned to reside in a SSO at an altitude of 380 miles (610 kilometers). The Long March 2C booster employed for Monday’s flight is a two-stage rocket developed by the China Academy of Launch Vehicle Technology (CALT). The rocket is mainly used to launch satellites into LEO and Sun-synchronous orbits (SSO). The 138-foot (42-meter) tall launch vehicle is capable of lofting payloads of up to 3.85 metric tons to LEO and has an SSO capability of up to 1.4 metric tons. However, for Monday’s mission, the improved version of the rocket was used – Long March 2C/SMA – with a higher payload capacity of 1.9 metric tons to SSO. On Sept. 9, 1982, the Long March 2C was sent aloft for the very first time. 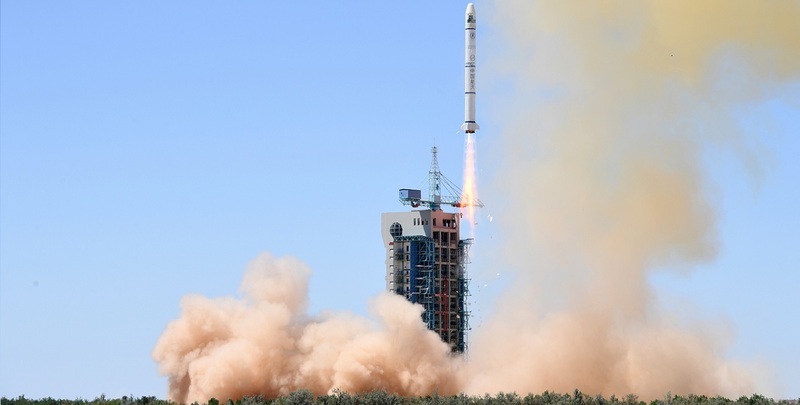 During that historic flight, the mission took place from the Jiuquan Satellite Launch Center and orbited the Fanhui Shei Weixing recoverable satellite. Monday’s launch marked the 279th flight of a member of the Long March family of rockets and the 19th mission to send a payload to orbit for China in 2018.